Greenhouse gas (GHG) emission from agriculture contributes significantly to the global climate change. The major greenhouse gases emitted from agriculture are methane (CH4) and nitrous oxide (N2O). These two greenhouse gases have higher global warming potential than carbon dioxide (CO2). The manuscript embodies biogeochemical cycling of CH4 and N2O. Microbial pathways of methanogenesis, CH4 oxidation, nitrification, and denitrification are outlined. Information on the agricultural strategies to mitigate GHG emission from soils are discussed. The review highlights significance of low-affinity methanotrophs that can be activated by repeated enrichment of high CH4 concentration, as global climate regulators. Iron redox cycling is also linked with soil CH4 uptake as repeated Fe3+ reduction and Fe2+ oxidation decline crystalline Fe fraction that enhances CH4 consumption by stimulating pmoA gene of methanotrophs. Studies suggested alternate flooding and drying as a potential approach to mediate atmospheric CH4 uptake in flooded soil. N2O emission from soil is the outcome of both nitrification and denitrification. However, in upland soil N2O emission occurs through nitrification and through denitrification from flooded soil ecosystem. Nitrogen-fixing Rhizobium sp. also produces N2O, and these bacteria can be manipulated to mitigate N2O emission by activating N2O reductase (nosZ gene). 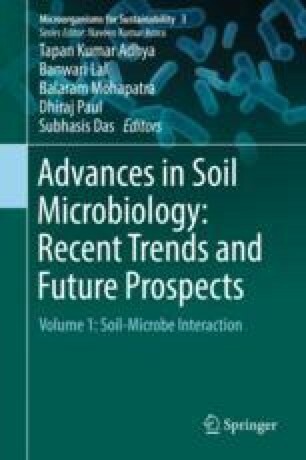 It is concluded that apart from regular agricultural resource management strategies, there is need of genetically manipulated soil microorganisms to effectively mitigate climate change. This manuscript is part of the project “Greenhouse gas emission from composting systems and characterization of GHG regulating microbes.” Authors declare no conflict of interest of any type.